Here are some facts about Mount Everest. Mount Everest is located in the Himalayan mountain range on the border between Nepal and China. It is the world’s highest mountain at 29,029 feet (8848 metres). Mount Everest is higher than 21 Empire State Buildings stacked on top of each other. It is actually increasing in height by a 1/3 of an inch every year. Sir Edmund Hillary and Tenzing Norgay were the first men to climb Mount Everest, in May 1953. At the summit, they took photographs, and buried a cross and some candy in the snow. Since 1953, over 5,000 people have climbed Mount Everest, although over 200 have died in the attempt. Over 100 dead bodies remain buried on the mountain, frozen stiff. Reinhold Messner made both the first solo ascent, as well as the first ascent without oxygen, in 1979. One person, Aba Sherpa, has climbed to the top over 20 times. To climb Everest typically takes years of mountaineering experience and training. However, the cost is relatively inexpensive at around $36,000 including food, a guide, travel to Nepal, accommodation and climbing gear. The youngest person to reach the summit of Everest was only 13 years old, while the oldest person to climb Everest was 76. At least one blind person has made it to the summit. The temperature at the summit never gets above freezing and can be as cold as -76 degrees F during the winter months. However, the leading cause of death on Mount Everest is avalanches. Because so many people climb the mountain, a lot of waste is left behind, including tents, clothing and oxygen tanks. About 900 pounds of rubbish was collected from the mountain between 2008 and 2011. 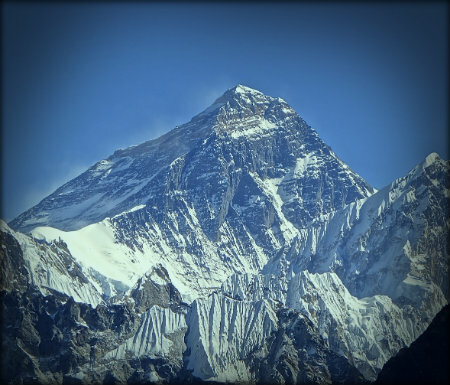 In each breath taken on Mount Everest, there is about 66 percent less oxygen than there would be at sea level. For a person to fully adjust to the difference in altitude when climbing, it would take 2 months. What next? Discover facts about some more of the world’s most famous mountains by visiting our mountains resources page.